“They were pretty cute, I will say,” said Melanie, my friend in all-things hospitality. Her annual Christmas party always shows up with something new – this year it was her Peppadew® trees. Yes, we are nuts about Peppadews. No, we don’t get paid to create recipes and blog about them. However, disclaimer alert − the Peppadew company did send me a supply after reading one of my blogs. I’m shameless about creating recipes and eating those little sweet piquant morsels of good for all the blog world to see! You’ve asked where to buy them. They haven’t gone mainstream as yet, so try the fresh olive bar in your grocery story. Some stores, especially those that carry unique items might have them. Wegmans and Harris Teeter have them. You can also order them from Amazon or from the Peppadew company. Have fun and have a Merry Christmas! I love you guys. “Makes two trees and serves a lot of people, if they like cheese balls.” Melanie suggests that for a small gathering, make one-third the recipe (1 8-ounce package cream cheese). In a large food processor, combine the cream cheese, Cheddar cheese, Worcestershire sauce, Dijon mustard, and Peppadew brine. Add salt and pepper to taste (about 1/4 teaspoon each). Process until mixture is thoroughly combined. Turn mixture into large mixing bowl. Stir in the chives and the 1/2 cup finely-chopped Peppadews. Divide mixture in half; put each half onto a piece of plastic wrap. Pull up the sides of the plastic wrap, and twist into a point on the top. Repeat with the other half of the cheese mixture. The mixture will be soft so you can’t really shape it at this point, but you can once it has chilled. Set the cheese blobs in a small pan, such as a layer cake pan, and put in the fridge and chill until firm. 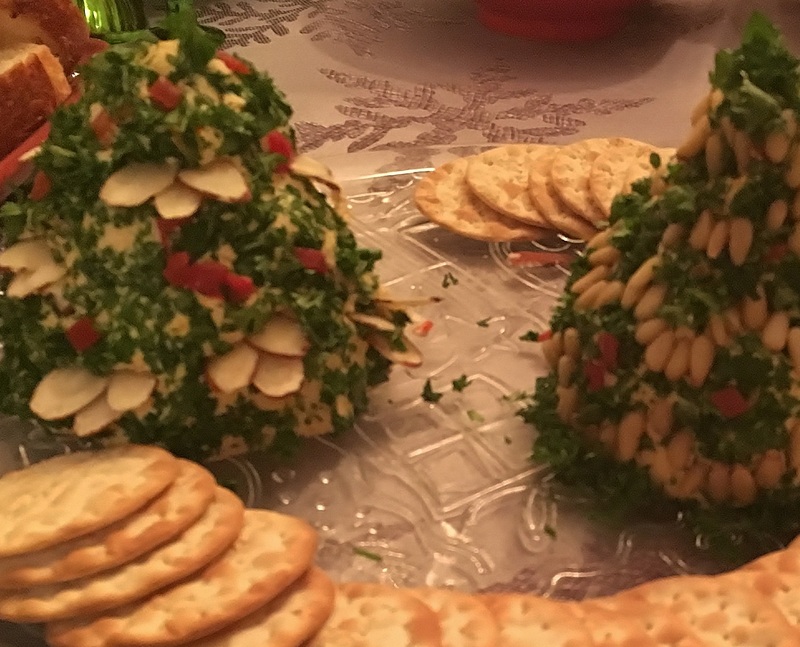 Just prior to serving, form each half of the mixture into a tree shape (cone); roll each tree in chopped parsley. 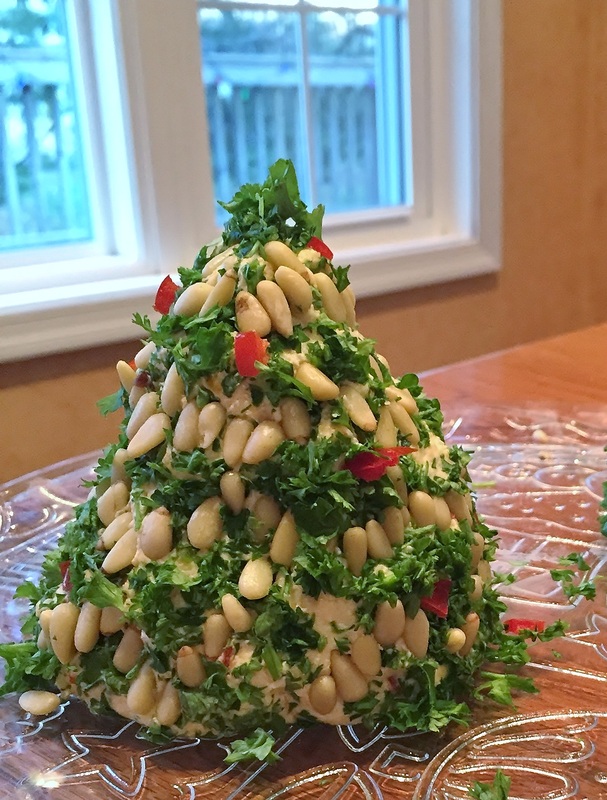 Decorate the trees with pine nuts or sliced almonds, and the 2 tablespoons of chopped Peppadew pieces. Serve with crackers. This entry was posted in Christmas, Cooking, Family, Food, Holiday, Hospitality by Barbara Garneau Kelley. Bookmark the permalink.